Oreo has hit the big screen and partnered with Paramount for a global movie deal with Transformers. If a giant, building consuming, robot worm that aids in terrorizing Chicago wasn’t enough for you, Paramount Pictures has come out with a new Transformers movie that features dinosaurs. The popularity of the Transformers franchise was not lost on Oreo as they aim to form their summer marketing efforts around this alien robot and delicious cookie alliance. Oreo is acclaimed for its innovative digital marketing but still understands the importance of traditional advertising techniques. The creative agency on the campaign is Interpublic Group of Cos.’ The Martin Agency, while the Paramount deal was brokered by MediaVest‘s LiquidThread. It will span 35 countries and features a TV ad directed by Michael Bay, whose latest Transformers movie, called “Age of Extinction” hits theaters in late June. 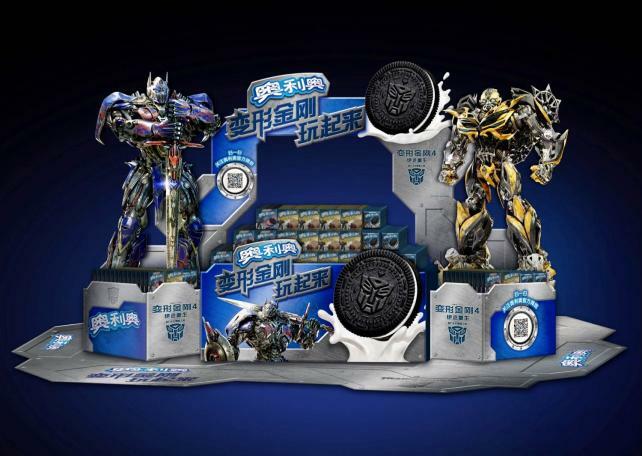 The famous cookie company has secured product placement in the movie and its products will contain Transformer themed packaging and cookie flavors. With 18% of its media budget being spent on digital this year, Oreo will also include movie-themed activities on its existing “Lick, Twist, and Dunk” app. Oreo Hits The Big Screen With Transformers Deal ; Nice pic . Oreos and toys. Hell yeah.